5-0 record midway through the season | ENTOURAGE BASKETBALL INC. The 8-man E.B.I. squad won a close game against a JustCo team that kept coming back from large points deficits. Effective in transition and playing compact zone defense for most of the game, JustCo remained dangerous until the last 2 minutes of the game. Solid work by the referees resulted in a game with a nice flow to it, less interruptions adding to the dynamic state of things. Physical play by both teams in the second half was allowed and EntourageBBall Inc. overcame their opponents switch to man defense easily, while remaining impatient and dribble-happy against the Zone. Some long-range sniping by Dave ( 2-2 on 3FGA) and Tony (1st game this season) relieved pressure on the bigs in the paint, giving big man Jean Baptiste lots of opportunities for putbacks and rebounds. It was another dominant performance by the french center,leading the team in rebounds, points and finishing off the match with a two-handed dunk late in the fourth quarter. 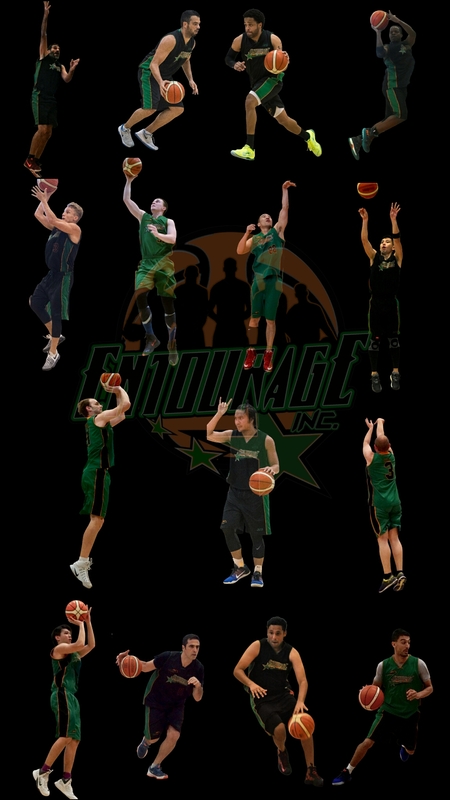 Entourage Basketball Inc. now 5-0 at the the season’s halfway point, have staked their claim as the team to beat in the Crossover League. The defensive intensity has been the key factor during the first half of the season, opposing teams score less than 40 ppg on average, but abysmal freethrow and three-point shooting result in too many close wins. Evan back after a 2-game absence was unable to gain traction on offense, still as reliable as ever on defense. First game of the season for Tony, solid performance: guided the team in the 3rd quarter. Nourdin and Terence rounded out the strong backcourt. Impressive game in the paint by JB and Sébastien, dominating on both ends of the court. Dave, also back after missing last two games, feisty on D and effective on the opposite end. Alex in foul trouble early, limiting his contribution. A calm, veteran-driven win by the league leaders. No panic in the face of multiple JustCo comebacks. Solid execution against man-defense, shaky against the 2-1-2 Zone. Good win.